One of them is suddenly scratching/chewing herself every 20 - 30 seconds. I look a look and I do see a few white specs on the exterior of her fur, but I'm not sure if those are the lice eggs. Trying to find a magnifying glass. Have to diagnose it before I can treat it. Any suggestions? Of course they could be mites too... but she's scratching an awful lot, she must have something going on. Is there any way I can treat this myself or is going to the vet for medication the only way? If it is lice, you may find you can spot the small brown things moving on her lower back near the base of the tail by parting her fur. You may not though, and mites are invisible to the naked eye, but I would treat her anyway. Pet shops sell a product called Beaphar spot on which will deal with any parasites. If I can get it over the counter that'd be great -- veterinarian bills can get expensive! I haven't noticed anything moving around, but I did notice this on her: http://imgur.com/a/NUN7f -- is that like an egg cluster or something? 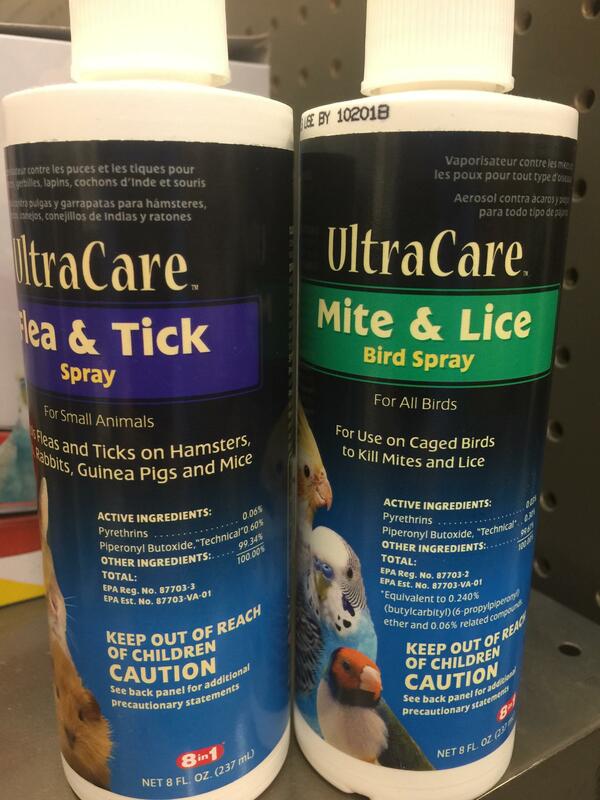 I couldn't find the Beaphar you mentioned, but I found this: http://i.imgur.com/mkIdLu4.jpg UltraCare Mite and Lice with Pyrethrins and Piperonyl Butoxide.... would that be fine? I want an effective solution but also the least toxic possible. Oh, you're not in the UK then? The active ingredients in our products is Ivermectin, I think the US has a different one but Pyrethrins and Piperonyl Butoxide doesn't ring a bell. However, some of the spot on solutions we use for rats are sold for birds, so it might do the job. A spot on is better than a spray if you can find one though.